One of the north-east’s major tourism draws has provided a temporary home for local Brownies and Guides. 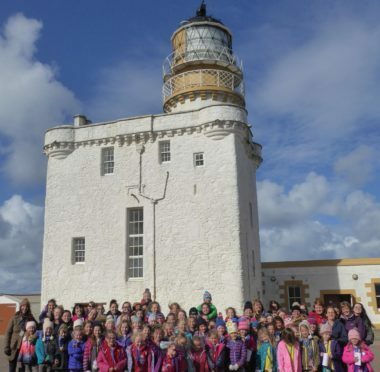 Almost 100 youngsters from Tarves rolled out their sleeping bags and spent the night at the Museum of Scottish Lighthouses in Fraserburgh. It was one of the requirements they needed to meet for an activity badge they came up with entirely themselves. They successfully completed the task to secure the lighthouse sleepover honour. Museum manager Lynda McGuigan was on hand to help out the intrepid explorers as they made their way round Kinnaird Head. She said Saturday night’s event was the first time she had ever slept at the attraction. Ms McGuigan also had to cater for dozens of hungry Brownies and Girl Guides. She said: “We had them sleeping all over the gallery floor. There were sleeping bags everywhere. “We did spaghetti Bolognese for 90 and gave them all hot chocolate. “This is the first time I have stayed in the museum overnight. “I slept near to the front door so I could be near the alarms and in case there were any problems. I got to sleep at 2am and was up at 6am. On Sunday morning the girls were treated to breakfast and took part in activities around the museum. They were also given a tour of the galleries of lighthouse lenses, models, flags and other maritime memorabilia found at the Fraserburgh attraction. Caroline Brown, leader of the 1st Tarves Brownies, said it was “amazing” to be able to sleep among the country’s best collection of lighthouse artefacts. She said: “It was such an amazing and unique experience sleeping amongst the lenses and exhibits in the museum of Scottish lighthouses in Fraserburgh. “Great fun was had by all 90 Rainbows, Brownies, Guides, senior section and leaders from Haddo District.